Since 2011, Gibson has fought to restrict the number of vacation rentals permitted in San Luis Obispo County. He has argued that vacation rentals negatively impact a neighborhood’s character. Gibson owns a property in Cambria and a home on Pacific Avenue in Cayucos, next to a county approved vacation rental. With county approval, a 100 foot minimum distance rule from an existing vacation rental property can be waved and a new vacation rental permit can be approved. 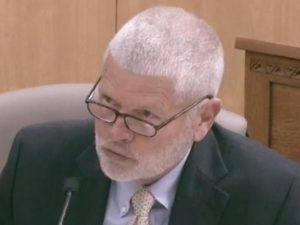 On two occasions, after the county board of supervisors disagreed with Gibson’s objections and voted to grant distance exemptions to local homeowners, Gibson took his objections to the California Coastal Commission. In 2016, the county board of supervisors approved a vacation rental exemption to a home approximately 1,200 feet away from Gibson’s primary residence in Cayucos. Without disclosing he lived nearby, Gibson argued that approval of the vacation rental permit would impact the character of the neighborhood,. Even so, he failed in his attempt to void the county board’s vote. Gibson did not respond to a reporter’s request for comment. Last month, Gibson asked the Coastal Commission to deny a county approved distance exemption for a proposed vacation rental in Cambria, because vacation rentals had “already eroded the long-term residential character,” according to a March 1 letter Gibson sent to the commission. In that case, Gibson succeeded in getting the commission to reverse the county board of supervisors’ decision. In the next few months, there are at least four requests for distance exemptions coming before the board of supervisors, all of which are for houses located near Gibson’s home in Cayucos. Tacker is asking county council to recommend Gibson refrain from participating in the upcoming vacation rental hearings because of the alleged conflict of interest. Tacker has also filed a conflict of interest complaint with the FPPC about Gibson’s past votes on vacation rental exemptions near properties he owns. Enough is enough. I just contributed more $ to Jeff Eckles’ campaign- he has a decent chance of giving Bruce the boot. http://www.jeffeckles.org I listened to Jeff on Congalton last night, the guy makes a lot of sense. Jackass or not at least you all can say he’s a common working man like most SLO co folks. Heck just a humble $2.5 million 170 acre ranch for his former abode. Rentals in Cambria and Cayucos, naturally he is looking out for us working stiffs. Oh BTW, has Adam Hill announced his engagement to Gary yet? Conflict of interest, graft, harassment and self adulation-business as usual in SLO. Been going on for years and no one has ever done anything about it. It’s like a cancer in SLO government and sooner or later it will spread and “kill” the good life that SLO once had. Although there is a cure and it’s called election time. Bruce needs to go. This is just another example of his “ I’m above the rules everyone else has to abide by” As a Dist. 2 resident I ask myself What has he done in 12 years to enhance the quality of life in our District. I was shocked to hear him take credit for the Cayucos pier, which was the Communites hard work and efforts, not his. Also how many sewers do we need between San Simenon to Los Osos, CMC. Where’s his efforts for regionalization to benefit all Dist. residents. Time for a change folks! MBvoter, you’re right – District 2 is direly in need of a new supervisor. Bruce, however, is such a “smooth talker” with an innate ability to lure voters into his camp, he may remain District 2 supervisor until he’s 80+ years old. Many of his constituents are County employees who help re-elect him because he woos them by stuffing their pockets with $1000 year-end bonuses for doing absolutely nothing except breathing. With that kind of monetary reward, who wouldn’t vote him back for another term! Sad. Although he doesn’t act as erratic and mentally challenged as his buddy, Adam Hill, politician Bruce Gibson has his own pathology and conflicts-of-interests, and he is part of the problem. He apparently is fine acting in violation of the law, and the scandal he had with a staffer on the county payroll cost taxpayers dearly, so he feels that taxpayers should be his legal piggybank. Cherie Aispuro (referenced in provided link) is now Cherie McKee. Cherie is Bruce’s current legislative assistant. It is my understanding that she and Bruce are now married. Please correct me if I’m mistaken.